Guests to the 221 Melsted Place B&B experience first class privacy, fine candlelight dining, superb service, timeless elegance and rich Icelandic history, along with all the other fine amenities the Bed and Breakfast has to offer. Escape into timeless elegance as you visit this historic picturesque estate, 221Melsted Place Bed and Breakfast. 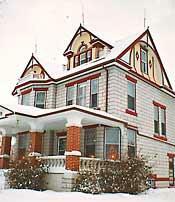 Built in 1910, the Melsted Place Bed & Breakfast is part of the original Icelandic community of Mountain, North Dakota. Surrounded by fertile farm lands of the Red River Valley, this stately Bed and Breakfast offers a peaceful setting and fascinating history that captures your imagination and takes you to another time and place.